Online Commerce comes in many forms and there is no “One Size Fits All” solution. Los Angeles Internet Marketing Agency built our first E-Commerce website in 1995 and we have extensive experience in working with our customers to build Viable, Secure, and PCI Compliant online sales channels for their businesses. Our skill set is 30+ years in the making and comes from countless hours invested, numerous mistakes, and many lessons learned. Experience isn’t expensive; it’s priceless. 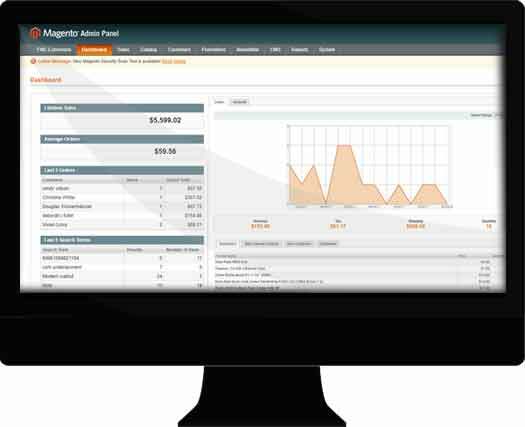 Manage your Products, Customers, Orders, and Promotions from a centralized mobile ready control panel. User-friendly interface for adding, removing, and managing products including Price, Inventory, Descriptions, Pictures. View your customer orders details, updated your customer’s order, and add shipping information to your customer’s orders. Manage your payment options including Credit Cards, PayPal, Checks, Purchase Order, PayPal, or other payment options. Shipping Integration Real-time shipping pricing from USPS, UPS, FedEx, and other carriers that offer E-Commerce integration. Los Angeles Internet Marketing Agency never charges for E-Commerce Consultations. We build with industry standard E-Commerce Solutions like WooCommerce, Shopify, Magento, Volusion, Miva Merchant, Oracle Commerce, and others. All E-Commerce websites are created with Google, Yahoo, and Bing in mind. We diligently test our websites to ensure the page performance and content rank well.